Friends of ours threw a medieval Scottish party last weekend, and costumes were encouraged. Even if they weren’t, my husband and I would’ve dressed up. Any excuse to bust out the medieval gear! We decided to go as Thane and Lady Macbeth. I’ve always wanted to try temporarily dying my hair red and Lady Macbeth seemed like a good excuse, so a couple days before the party, I spent some time with my head in a pot of hot Kool Aid. My husband obligingly helped ladle the stuff over my hair. This is a totally normal thing to do. The end result of the Kool Aid experiment. Not bad! I made my husband a quick kilt, and we reused other pieces from old costumes. We each won best costume for our respective gender! The party was a lot of fun and gave us a chance to fight with swords, throw knives and axes, and practice our archery skills. My husband also ate haggis, because he’s a brave, brave man. I decided I was okay with not being brave. And it was a good chance to take pictures. Lots and lots of pictures. The couple that kills kings together stays together? Pretty sure that’s an incorrect interpretation of the play. And the English themselves, perhaps they too will pass! Is it–can it be–a book review? I shall not go to my bed tonight, my love is not in it; I shall lie on the gravestone–break, if you must, my poor heart. There is nothing between him and me tonight but earth and coffin and shroud; I have been further many a time, but never with a heavier heart.–Welsh; traditional verses; seventeenth century? The world has laid low, and the wind blows away like ashes Alexander, Caesar, and all who were in their trust; grass-grown is Tara, and see Troy now how it is–and the English themselves, perhaps they too will pass!–Irish; author unknown; seventeenth-eighteenth century. Granted, some of it is dull too, and I was disappointed that so many of the selections were fairly modern (sixteenth through eighteenth centuries) when I was hoping for more of the older, harder-to-find Celtic poetry of the first thousand years AD. Some of the excerpts seemed to leave off in odd spots. Overall, though, I enjoyed the somewhat random assembly of stories and poetry. In other bookish news, I’m hooked. Giving books away is almost as fun as getting them. 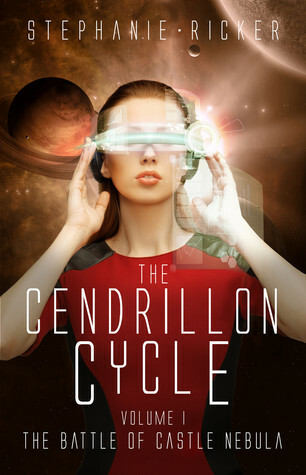 This time I’m offering a free autographed paperback copy of The Battle of Castle Nebula, volume I in The Cendrillon Cycle! Giveaway ends July 17, 2016. Temporary madness seizes us all occasionally. Mine took the form of signing up for the Spartan Sprint, a 5-mile mudrun with 20+ obstacles including throwing myself over walls varying in height from 8-12 feet, crossing giant monkey bars, crawling under an interminable field of barbed wire, hoisting 100-150 lbs into the air, carrying sandbags while running around hills in the woods, carrying a bucket of rocks up and down a hill, scaling a bouldering wall, carrying a boulder, climbing a rope, and too many other ridiculously hard activities to name. Cargo net: by far the easiest thing I did that day. Ending with a jump over the fire pit. My brother ran with us and filmed with his GoPro. He’s a professional videographer, so his video of the event is fantastic and makes us look so much cooler than we really are. Thanks, bro! The race was a blast (I particularly liked the walls), but I would think twice before doing another one quite this intense. A 5k obstacle/mudrun would closer to my level of athleticism, and my husband, who has done a million of these races (because he’s a beast like that and his madness is of the permanent variety), said it was the hardest one he had done with the exception of the Tough Mudder, especially when it came to upper body work. I did get pretty woozy at one point and had to sit down, and that muddy rope climb at the very end of the race was not happenin’. The Spartan Race isn’t quite like other mudruns in that if you can’t complete an obstacle, you’re supposed to do 30 burpees before continuing. I don’t know if you’ve ever attempted 30 burpees, but it’s rough. Like an idiot, I completely forgot sunscreen, so I turned into a sore tomato the next day. I then transformed into a red, peeling banana. Devastatingly attractive! Still, as my first mudrun/obstacle race, the experience was a TON of fun, and I’d love to do something similar again! Without burpees. This past weekend, I had the opportunity to be a chaperone on a three-day field trip to Washington, DC with 19 middleschoolers. You get lucky like that when your husband is a superhuman teacher who can pull off organizing a massive trip in the middle of working on 17 million other things, including a master’s thesis. Crazy, but with eyelashes to die for. If you’ve ever wondered whether it’s possible to see Ford’s Theatre, Holocaust Museum, Vietnam War Memorial, Korean War Memorial, Lincoln Memorial, Arlington Cemetery, Iwo Jima Memorial, Capitol Hill, Supreme Court, Library of Congress, World War II Memorial, Martin Luther King Jr Memorial, Franklin Delano Roosevelt Memorial, Jefferson Memorial, White House, Museum of American History, Natural History Museum, National Gallery of Art, and Air and Space Museum in three days, the answer is: you can. But only if you care nothing for your sanity. But even apathetic teenage angst couldn’t keep me from enjoying DC. It’s a beautiful city, with more history than you can shake a stick at. At every turn there’s some inspiring monument (inspiring to those of us who aren’t teenagers, anyway). I desperately wanted to see more of the museums, since time necessitated that our visits there were distressingly brief. But DC will always be there, and at the end of the trip, even the infuriating little monsters had all signed a book thanking us for taking them on the tour. So I guess I’m glad I didn’t surrender to my homicidal tendencies. On an unrelated note, if you haven’t already signed up for the Rooglewood Quarterly, you should! The upcoming issue features a map of Goldstone Wood from Anne Elisabeth Stengl’s series, as well as an article by yours truly. I slaved over that article on the plane back from San Diego; read it and don’t make my efforts for naught!